Bee id chart - species, region, size and habitat. Here below are the most common types of bee species, size, characteristics, population, and world region. Honeybees are very important to animals and humans. Nearly 1/3 of the entire worlds food supply is accomplished from bee pollination. : ½” to ¾” inches. : Up to 5,000 - 50,000 members per nest. It has been said that honeybees are not native to the Americas; that they were initially brought from Europe and caused Americas landscape big improvements through increased pollination to agriculture and cross pollination with plants. Honeybees are the only insect that make food people normally eat. Honeybees live year round but are more dormant or quite during winter. When not in a bee box, honeybees are commonly observed on flowers. 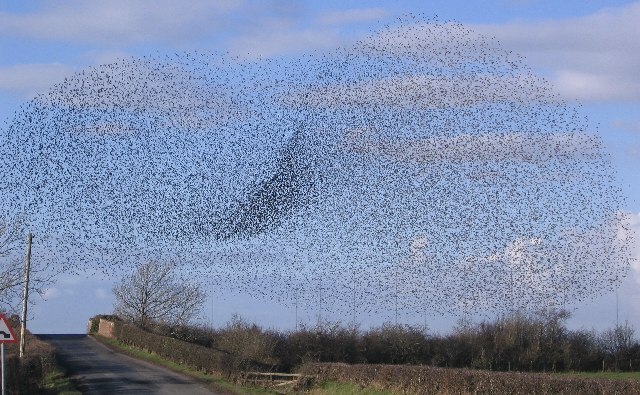 Less commonly honeybees can be observed as a giant swarm migrating in a circular motion to a new home. 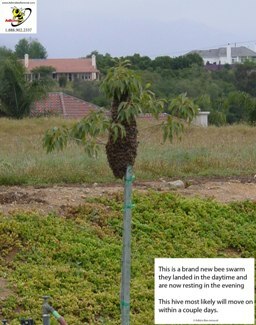 Occasionally the swarm will land and rest on a tree or shrub. From houses & buildings, honeybees may occasionally be observed as a handful of bees buzzing around a wall, eave, house chimney, or other structural opening. This website was created to provide information on how to get rid of bees based on the location of bees. 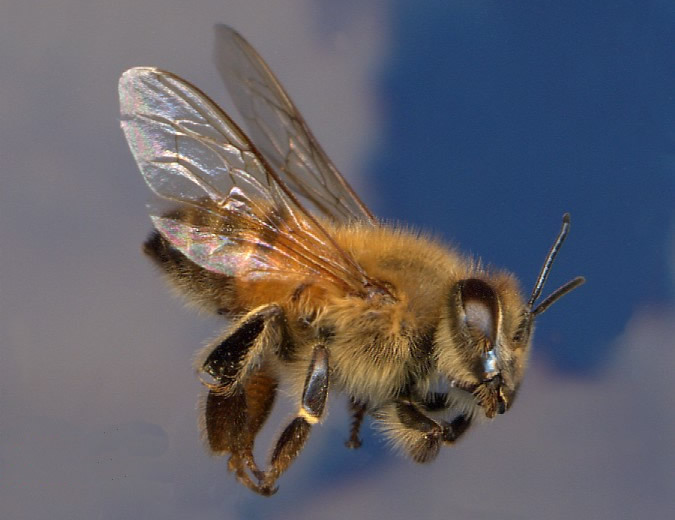 In hot or dry seasons, honeybees may show up at water sources. For may centuries honey was considered by the ancients to have healing powers and medicinal virtues; only more recently did science prove this. Honey can be kept indefinitely. Honey should not at all be consumed by human infants. Honeybees are one of the only bee species that live year round as a hive. Bumblebees, carpenter bees, yellowjackets, wasps and hornets all flee the nest by late fall season to safely survive winter. Apart from this common european honeybee, other honeybee species exist from Europe, Africa, and Asia and are more native to those environments. : Up to 5,000 - 15,000 members per nest. : Africa, South America, Central America, Mexico & the Lower region of the United States. The Africanized honey bee or ("hybrid honeybee") is very similar in size and genetic make up to their european honeybee neighbor. The AHB is a stronger more agile bee to tropical environments. The AHB is said to be less prone to effects of diseases that effect domesticated honeybees, though some believe that it may have more to do with how the bees are treated. Within the past decades, beekeepers & scientists have been cross breading european & african honeybees in efforts to improve the productivity of the honeybee relating to crops within the geo region, as well as & human interaction or temperament of the honeybee. These hybrid bees have become the main source of beekeeping throughout Mexico and tropical Central and South America having improved honey production. Within the US, owners occasionally seek information on how to get rid of bees when nesting in structures. Bee removal from wall, roof, and eaves of the structure can be very difficult. -- pictures of bee removal. Central and south America experience less problems with bees nesting in structures because the houses are typically made of concrete and brick without common wall voids & attic voids were bees may build hives. Within the US, africanized /hybrid bees have been popularly identified in California, Nevada, Arizona, Texas, and Florida. In the past these bees have been blamed when a bee attack occurs. The bees have naturally progressed within the Americas intermingling with the european honeybees originally brought from Europe. More presently within the US beekeepers are experimenting with hybrid bees. Speaking with beekeepers regulary around the US, many beekeepers prefer bees with the this hybrid dna strand or genome. The africanized /hybrid honeybee as mentioned, has not progressed as well in the cooler climate regions with long winters. AHBs are said to be more protective of their home and can attack to defend it in great numbers; they stay aggressive longer once disturbed. As with all honeybees: AHBs are aggravated by loud noises, vibrations, like all honeybees they loose there stinger after stinging a human or animal. All honeybees can get provoked by certain smells such as fresh cut grass, bananas, as well as the breath of people and animals. Honeybees should be respected and care take when near a beehive. Because of warmer winters, africanized bees do not need as large a hive body to survive the winter, traditionally keeping smaller hives compared to bees from colder climates like Europe. AHBs may experience difficulty in cooler climates as a larger quantity of bees /nuclease /hive body is needed to stay warm though a long winter. Additionally, with short winters bees from Africa do not typically store as much honey to survive a longer winter. Visit africanized honeybees for a more thorough in-depth read, migration paths, and beekeeping practices. : 1” to 1½” inches. : From 10 - 100 members per nest. : Throughout the US & Canada. Bumblebees are commonly identified living in nests in smaller number from 15 to 50 bees. Nests start small in spring and grow larger during fall/autumn season. Bumblebees are near twice the size of a honeybee. In the mid & upper regions of the US and through Canada you are likely to see brighter more colorful bumblebees than in the lower portion of the US. Bumblebees may build their homes in cavities of the ground such as an abandoned gopher hole, under a shed, or in other low to the ground places. Bumble bees are seasonal bees; after fall season, only the queens survive, the nest is abandoned with the queen overwintering to survive their species to the following year, starting a new colony in the spring. Like honeybees, bumblebees visit flowers to gather nectar and pollen, they are non-aggressive while traveling and foraging. They can be known to defend their hive aggressively and can sting multiple times as bumblebees don't lose their stinger. Compared with the past, it is widely believed that bumblebee species (like honeybees) have a more difficult environment to survive in due to pollution & climate changes. Male carpenter bees are identified as solid black, and surprisingly they cannot sting. Female carpenter bees are identified as brown in color and sting quite well. Carpenter bees are sometimes mistaken as bumblebees however carpenter bees are shiny, have fewer colors, and are less fuzzy /with less hair. Like the bumblebee, carpenter bees average one inch in length. The carpenterbee flight is faster than a bumblebee, and is also a bit more jerky or zig zag, perhaps similar to a hummingbird. Carpenter bees are solitary bees; their homes can be identified as they burrow holes into wood, the size of a dime or penny commonly into wood patio covers, eaves, and other structures. Carpenter bees can cause damages when burrowing holes into wooden foundation structures; These bees may become a nuisance when living in patio coverings close to the house. : From 200 - 10,000 members per nest. : Tropical Regions around the World & a small very portion of the US. Less common to America, stingless bees are natively found in tropical and semi /subtropical regions around the world. Many thousands of stingless bees species currently exist. The stingless bee is identified as not having a stinger and may bite to defend. Stingless bees are smaller and less aggressive than honeybees. They keep smaller hives than honeybees from a few hundred to thousands. Ranging in size from 1mm to 12mm (getting as large as 1/2 inch). Stingless bees nest in tree trunks, on branches, and ground cavities. Stingless bees are occasionally found around housing structure. Stingless honeybees as pollinators are claimed to be a lesser a problem pest to home owners than honeybees, though they are outperformed by the honeybee both as pollinators and as honey producers. Stingless honeybees are very effective pollinators to small nano-areas that honeybees may not forage /visit. Stingless honeybees arrive to these smaller newly blossoming areas before the honeybee and thus is a great assistance with pollination to the areas beginning to blossom. In South America, the more newly integrated africanized /hybrid honey bees is said to have caused a slight though non-critical decline to the stingless bees of the region. Some wasps look like bees! Visit the wasp identification guide to learn basic information on the most common types of wasps. Many types of wasp species currently exist.